On Tuesday, March 29th at 1:00 pm, archivists from the Academy of Motion Picture Arts and Sciences’ (AMPAS) Margaret Herrick Library, Academy Film Archive and Oral History Projects Division will present “Documenting the Movies,” a panel on conducting research in film and film-related archives. Presenters will discuss their efforts to preserve and share the Academy’s manuscript, film and oral history collections, and will offer expert advice on how to use these materials. Genevieve Maxwell, Coordinator/ Archivist, Oral History Projects, AMPAS. Moderator and Chair: Robert W. Woodruff Library Film & Media Studies Librarian James Steffen and Goodrich C. White Professor of Film & Media Studies Matthew H. Bernstein. 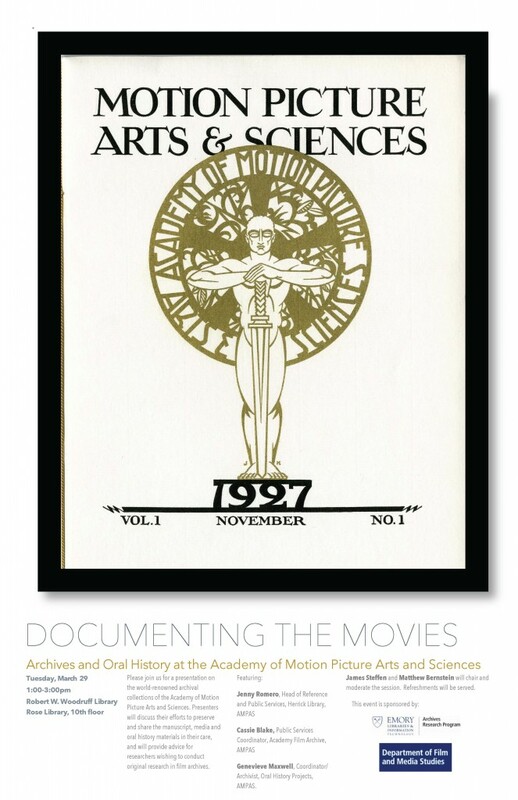 “Documenting the Movies” is co-sponsored by the Archives Research Program (ARP) and the Department of Film and Media Studies. The presentation is part of ARP’s “Understanding Archives” speaker series. Other ARP programs include a 2-day archives training intensive for Emory graduate students; its spring session will take place on May 16 and 20. For more information on these and other events please e-mail us at archives [dot] research [dot] program [at] emory [dot] edu or visit the program’s website.